If you have a garden, no doubt you love relaxing on the lawn and hosting BBQs among your plants on a summer's evening. But long working hours and commutes, busy social lives, hectic kids' schedules, mobility issues and lack of confidence can all hinder us from keeping on top of our gardens' upkeep. Thankfully, the tech industry is well aware of this and has your back, my friend. 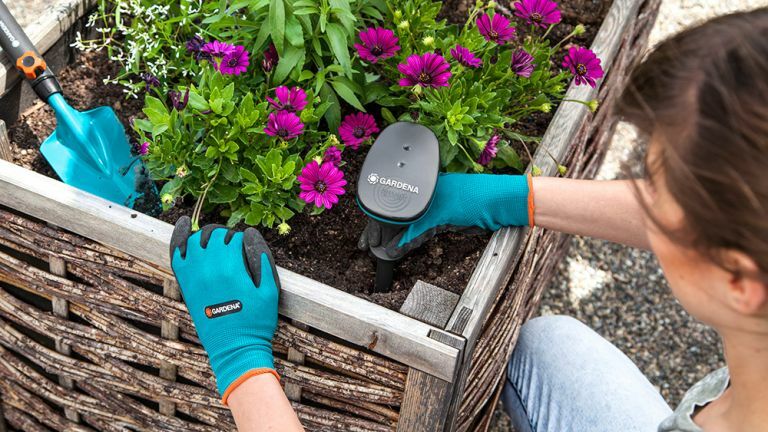 These six innovative gadgets are here to help with keeping your grass, shrubs, flowers, herbs and veggies in prime condition. So you can enjoy the rewards of a lush lawn, flourishing flora and verdant foliage from the comfort of your newly acquired rotating summer house. Impervious to inclement weather, the Honda Miimo 3000 will happily tackle 25-degree inclines and navigate around trees, ponds, benches, swimming pools and lazy Labradors. After about 90 minutes of zigzag trimming, the little fella will trundle back to its docking station for a 45-minute recharge before heading off again. Before long, your lawn will start looking perfectly manicured and your friends will be suitably impressed. But not as impressed as when you tell them you can program the mower from your phone while chilling under the pergola. The robot mower is the ultimate must-have garden gadget for modern homo sapiens and although there are better VFM proposition, none do robot-related stuff better than Honda. The top-of-the-range Miimo 3000 is designed for large gardens up to 4,000m2 and has an ample cutting width of 22cm and several cutting heights (from a close-shaving 2cm to 6cm). For those who can’t even be bothered to bend over to use the Miimo interface, the whole shebang can be programmed and controlled from your phone (iOS or Android) using Bluetooth. As with all robot mowers, there is a large amount of setting up to do before it can be let loose, most notably having a hidden wire fitted around the perimeter of the lawn so Miimo doesn’t venture off into the rough. You will also need an electricity supply to feed the mower’s recharging station. • Read more about robot mowers, then fire the gardener. You do the gardening? Then fire yourself. If you’re a horticultural connoisseur and are a bit tech savvy, consider installing this pricy but effective Wi-Fi-enabled water management system from the house of Gardena. The package includes a Wi-Fi transmitter – best placed near a window looking out on to the garden – a single three-in-one sensor on a spike that measures air temperature, light intensity and soil moisture, and a battery-powered hose pipe unit for the tap. The system is app-controlled so you could feasibly check the status of your garden and command a watering session from the comfort of a Caribbean deckchair. The app’s adaptable scheduling feature enables you to set the system so it only waters if the moisture in the soil falls below a pre-set value. Or you can set a regular schedule so the system fires up either first thing in the morning, at dusk or both. You can also pre-set the length of each watering session. And if you’re home and want to pull out your hose for a quick spritz, simply hit the big centre button on the tap unit and spray away. This is top, time-saving hands-free apparatus that’s perfect for irrigation systems, greenhouses and garden sprinklers. But boy, it ain’t cheap given that it’s essentially a router, a tape controller and a sensor spike. • Read about garden watering systems that cost a tad less. Why have a bog standard summer house built in the garden when you can lounge outdoors, undercover in a high-tech rotating space pod? Constructed from laminated spruce timber and with an interior 2.4 metres wide and 2.2 metres tall, this stunning pod is the last word in garden luxury. It comes with a circular waterproof vinyl bench pad with room for up to seven guests, plus a centre table that can be lowered so you can add a centre cushion pad to turn it into a bed. The stainless steel exterior touches and mirrored louvres above and below the UV protected acrylic tinted windows reflect heat and add an extra touch of class. Interior lighting is an option for those who wish to chill under moonlight. However, the very best thing about this pod is that it revolves 360˚, so no matter which way the sun is shining or the wind is blowing, you’ll always be in the comfort zone. That's worth 8 grand of anybody's money. If the Gardena Smart System seems a financial step too far, maybe opt for this more simplified app-enabled version from Hozelock. The Cloud Controller is comprised of an AC-powered hub and battery-powered valve unit for the tap. Like the Gardena system, you will need to site the hub it comes with near your Wi-Fi router and preferably on a window sill because it requires connection via an Ethernet cable. Bear this in mind if your main Wi-Fi router is on the other side of the house. Once set up, this is an exceptional way to control your watering schedules from afar, whether it’s from the sofa, the office or a beach in Thailand. Simply launch the free Hozelock mobile app (iOS and Android), set yourself an automatic watering schedule (making sure that the tap’s on and the hose is attached to a sprinkler or irrigation system) and leave it to manage the garden while you’re away. The system is also linked to a weather service that will let you know if rain is on the way so you can disengage the system temporarily. And if you fancy turning on the system manually – say to mischievously soak the neighbour who has been nicking your turnips – just tap the app’s ‘water’ button and, voila, instant dousing. A system like this (or any of Hozelock’s cheaper water controllers for that matter) is a godsend in dry weather when the lawn and borders require regular watering. It not only helps reduce water consumption, but it’s a handy fail safe back up for absent-minded types. Granted, you’ll find most gardening answers on Google. But for a more personalised service, this app can’t be beaten. Not every high-tech gardening gadget need cost a million quid. This iOS/Android app, for instance, costs zilch at first, until you realise how handy it is and opt for the relatively paltry £3.99 per month plan. So what the hell is an app doing here among all this snazzy gear? Well, let’s say you’ve just moved into a new home with a garden like something out of the Chelsea Flower Show and you haven’t a clue what’s what. Or maybe you just need some horticultural help with a rose bush that’s covered in some weird powdery mildew. Simply launch the Garden Compass app, take a snap shot of the flower, plant, shrub or tree in question and type something like ‘what the heck is this?’ (maybe tone it down a bit), hit the send icon and your query will wing its way over to a group of worldwide SmartPlant experts who will ponder over your leafy conundrum and send you an answer within 24 hours. If you have several acres of pasture to maintain (or just want to impress your mates because you have more splosh than sense), you need to make like Farmer Brown and invest in one of the best ride on mowers. Our guide to the best features some relatively pricey little numbers but this is something else. In fact, this muscular green and yellow hunk is the Range Rover SVAutobiography of agricultural machinery. This bank-busting beauty features a three-cylinder, 23.5bhp, 1,116cc diesel engine, hydrostatic transmission for smooth acceleration, hydraulic power steering, a 20.4-litre tank for lengthy mowing sessions and headlights for midnight bush whacking. On the grass cutting front, it comes equipped with a choice of cutting decks (122cm and 137cm) with 13 heights (from 2.5cm to 11.2cm). It’s also available with two hydraulic 650-litre dump options (tractor speak for grass collector): ‘low’ for compost heaps and ‘high’ for depositing the cuttings over the neighbour’s fence. Purchase the optional ‘homologation kit’ and you can even use this mower for your commute to work, perhaps trimming a few roundabouts en route. Now THAT is innovative.